Background: In our previous work, several piperazine derived bis(dialkylaminethiocarbonyl) disulfides and disulfide esters of dithiocarbamic acid have been synthesized and evaluated for their spermicidal and microbicidal efficacy. These studies have provided some promising compounds for developing a dually active vaginal microbicidal contraceptive which is under pre-clinical stage. Objective: The main objective of this study was the design synthesis and biological evaluation of bis(dialkylaminethiocarbonyl) disulfides (4–15) and 2,2’-disulfanediylbis (3-(substituted-1-yl) propane-2,1-diyl) disubstituted-1-carbodithioates (19-28) as non-surfactant molecules capable of eliminating Trichomonas vaginalis as well as irreversibly immobilizing 100% human sperm promptly. Method: Spermicidal, anti-trichomonas, cytotoxicity and biocompatibility study of the synthesized compounds was done as per the reported methodologies. Result: Among bis(dialkylaminethiocarbonyl) disulfides (4-15, Table 1), compound 4 (MEC 0.02 mM) was found to be the most desirable for spermicidal activity as it was 40 times more active than Nonoxynol-9 (N-9), and also active against Trichomonas vaginalis (MIC 0.02 &1.10 mM). 2, 2’-disulfanediylbis (3-(substituted- 1-yl) propane-2, 1-diyl) disubstituted-1-carbodithioates (19-28, Table 2), and compounds (19, 22, 23, and 24 MEC 0.05 mM) were sixteen times more active than N-9 with promising Trichomonacidal activity. 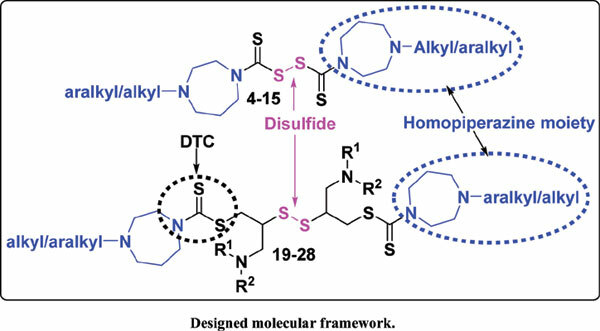 Conclusion: This study suggested that the disulfide linkage alone and dithiocarbamate along with disulfide group within the same chemical entity impart the desired multiple activities of compounds. Keywords: Microbicide, spermicide, homopiperazine, dithiocarbamate, anti-trichomonas, contraceptive, disulfide. Keywords:Microbicide, spermicide, homopiperazine, dithiocarbamate, anti-trichomonas, contraceptive, disulfide. Abstract:Background: In our previous work, several piperazine derived bis(dialkylaminethiocarbonyl) disulfides and disulfide esters of dithiocarbamic acid have been synthesized and evaluated for their spermicidal and microbicidal efficacy. These studies have provided some promising compounds for developing a dually active vaginal microbicidal contraceptive which is under pre-clinical stage.